Be sure to stop in Goofy's and experience the Bluegrass sounds of Salem Bottom Boys. They'll be performing tonight in our Pavilion rain or shine from 6pm - 10pm. Remember...there's NEVER A COVER CHARGE to hear great music at Goofy's! We've got you covered! See you there! 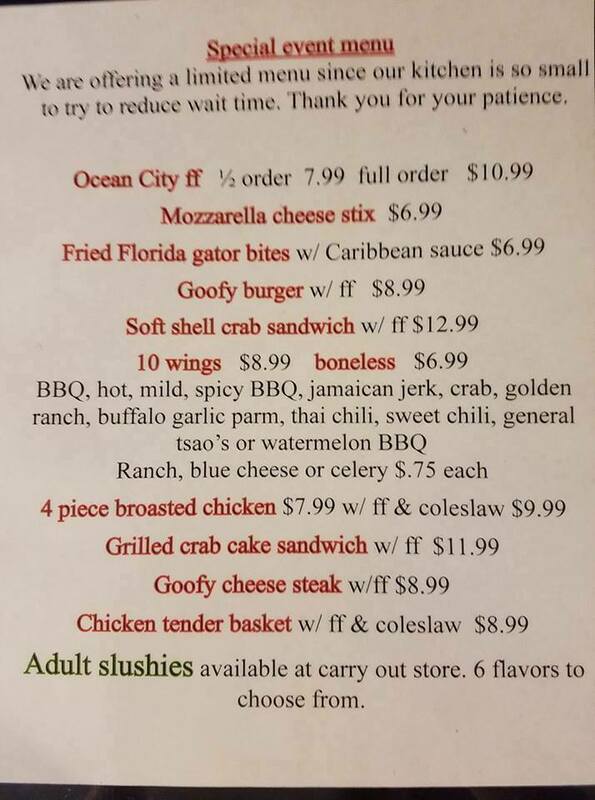 Did you know that Goofy's NEVER charges a cover charge to enjoy the bands? Come check out Dying Breed tomorrow night from 6 pm - 10 pm. Here's a look at our Special Event Menu that will be offered in the Pavilion. PLEASE be patient as our servers work their tails off to serve you as timely as possible. Please enjoy the music while you wait. See you there for some great entertainment! All vehicles are welcome. 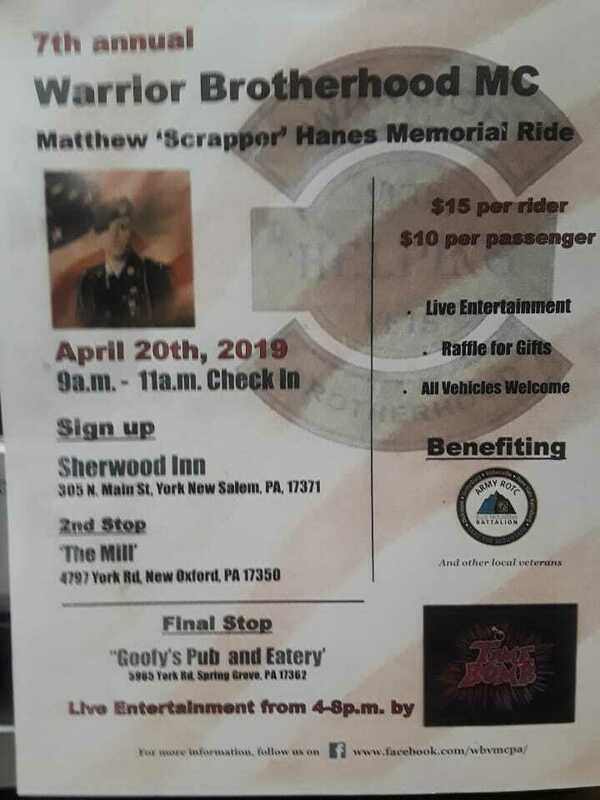 Proceeds Benefit: Army ROTC, Blue Mountain Battalion. Ride begins at the Sherwood Inn and ends at Goofys. "Time Bomb" will be rocking it out from 4 pm - 8 pm @ Goofy's. Mark those calendars for June 8th @ Goofys! 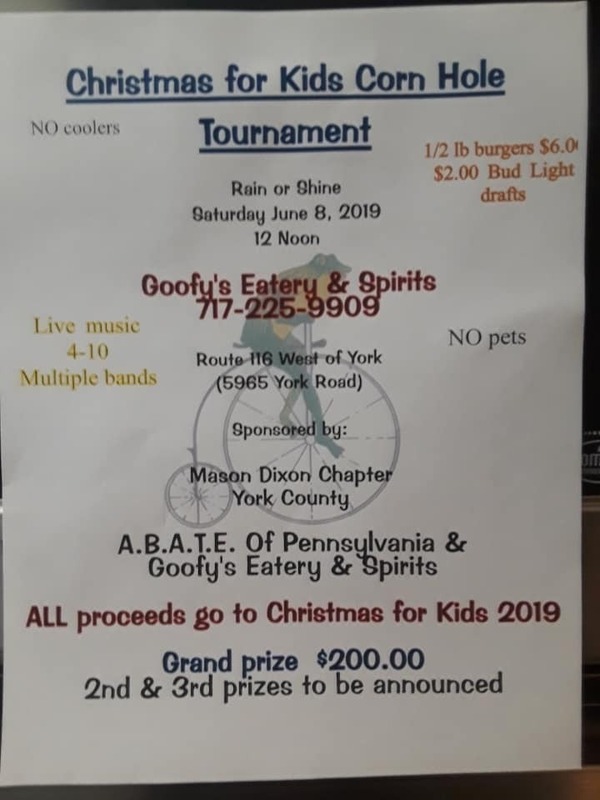 It's our Annual Christmas for Kids Event and we'll be having a Corn Hole tournament with proceeds going to Christmas for Kids. Just when we thought it couldn't get any better than that, we decided to bring in 4...YES...4 bands from 4 pm -10pm to take this event over the edge! Does your team have what it takes to win? Don't forget our guest bartenders that'll be there serving up drinks for you! It's sure to be a blast! The COUNT DOWN is on!!! Only 3 more days til they're back at Goofys to Rock you! Jackie Joyce's voice will mezmerize you! You can literally close your eyes when she sings any Stevie Nicks song and you'll think it's Stevie up on stage. One time hearing them and you'll be hooked! Get your babysitters lined up and plan to meet us in the pavillion at Goofys this Saturday night from 6pm - 10pm. Multi-Time International Bluegrass Music Association award winners and the best in Powerful, Intense Bluegrass Music! The band originates from Carroll County, Maryland and most of them still make it their home. The band has always built its foundation on Bluegrass music, but Bluegrass goes hand in hand with Bluegrass Gospel. You can't have one without the other. Striving for perfect harmony the boys let the instruments fill in the background. With more and more people hearing and learning of their Gospel songs, the Salem Bottom Boys were soon invited to numerous churches to play for services, picnics, and coffee houses. Now they are playing at both Bluegrass and Gospel shows, with neither taking a backseat to the other. Eclipse the Ultimate Journey Tribute plays selections from the Classic Steve Perry era. Songs are performed with the same passion and energy as that of Journey's live shows.. Audiences will absolutely find themselves dancing and singing the power ballads and high energy songs from Journey’s chart topping hits. If you love Journey, like we love Journey, you will not want to miss Eclipse the Ultimate Journey Tribute's high energy show. The music of Journey has an enduring appeal that reaches fans world-wide. Let Eclipse the Ultimate Journey Tribute bring the LIVE Journey experience to your Venue. Eclipse the Ultimate Journey Tribute has established themselves as a Premier act on the East Coast. There is no other act of this caliber performing Journey on this level. They are a MUST SEE to Believe IT Show. "Radio Bravo" was formed in 2017 by bringing together the varying styles and influences of four of the area’s most talented and active musicians. The Mosley Brothers are a group of talented young bluegrass musicians. A fusion between traditional bluegrass and progressive acoustic music. Poison Whiskey Band was born into the blues atmosphere of rock-n-roll in the summer of 1982. A heartfelt intensity keeps you rocking through the night, with dueling guitars, and rock solid rhythm and vocal sections. PWB reproduces the greatest hits from bands such as The Eagles, Rolling Stones, Bob Seger, Lynyrd Skynyrd, Bad Company, Little Feat and many more. 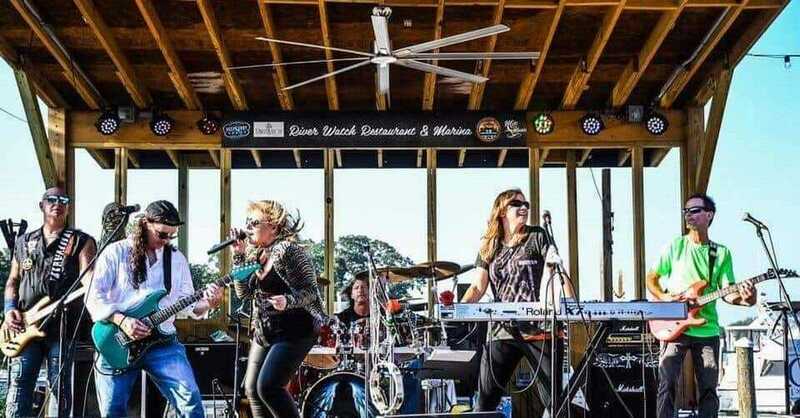 Poison Whiskey has had the honor of sharing the stage with many great national acts such as Lynyrd Skynyrd, .38 Special, Marshall Tucker Band, Molly Hatchet, Humble Pie, Edgar Winter and The Outlaws. And the label says Poison Whiskey. 6¢ (Six Cents) is in their 15th year together as a versatile and multi-faceted classic rock band. Original founding members Brian Colgan; (vocals, guitars, keyb...oards, flute and violin) John Keefauver; (keyboards, sax, guitar and vocals) and J.J. Dugan (vocals and drums), are joined by Aaron Baugher, (guitar and keyboards) ), Jeff Maus (bass and vocals) and Carly Miller (vocals, guitar and percussion). Their broad range of music covers lighter acts like CSN&Y, America and Jimmy Buffett to the eclectic music of the Dave Matthews Band, Steely Dan and Rusted Root, to the full out rock of Boston, the Eagles, Led Zeppelin, Heart and Pat Benetar. The band released a self produced CD of their own material, entitled “Heads Up” in 2008 and plans more original recording in the future. Tons of vocal harmony, instrumental versatility and an ability to cover a wide spectrum of styles and eras adds up to the popular Hanover area based band, 6¢. Stop in for fine eats or fine drinks. Check out our events below and stop in to visit us!